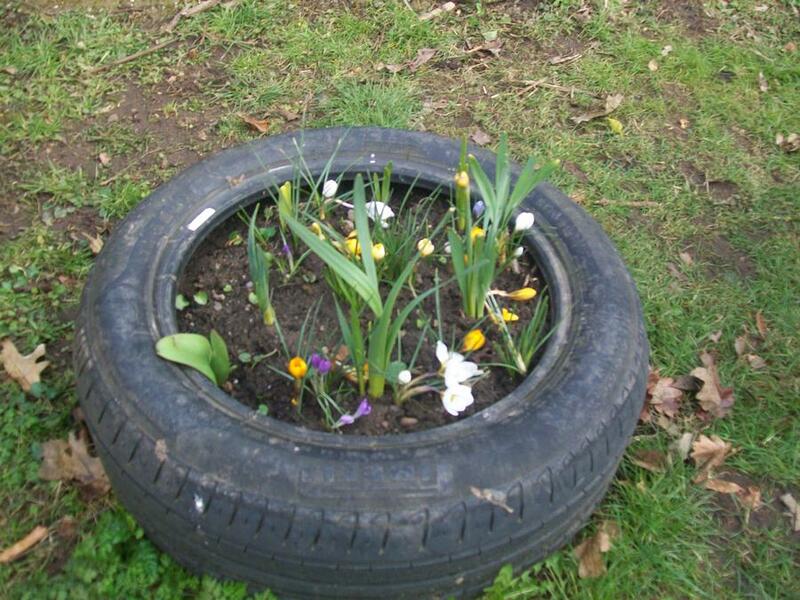 A member of the Eco-council kindly donated some bulbs for the school to plant around the pond area. 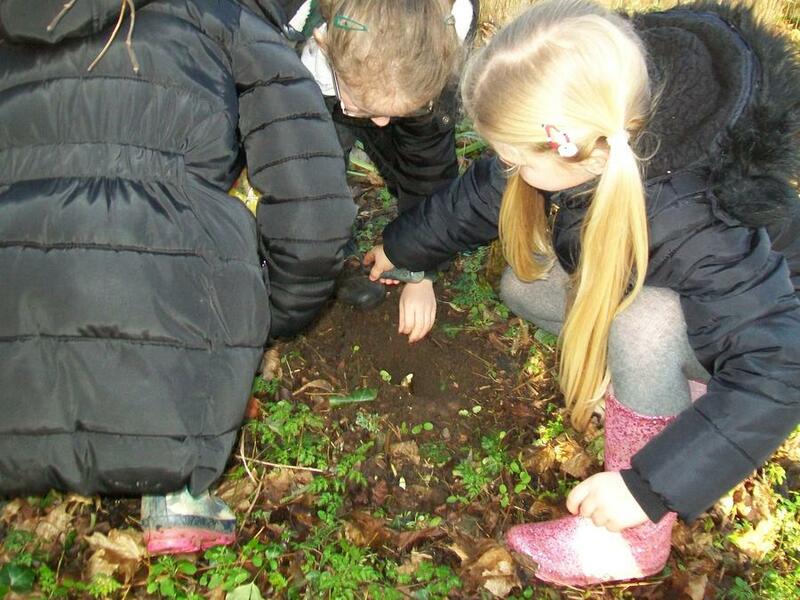 A group of children volunteered to help Miss Curnock plant the bulbs, we had snowdrops, Crocus' and Daffodils. 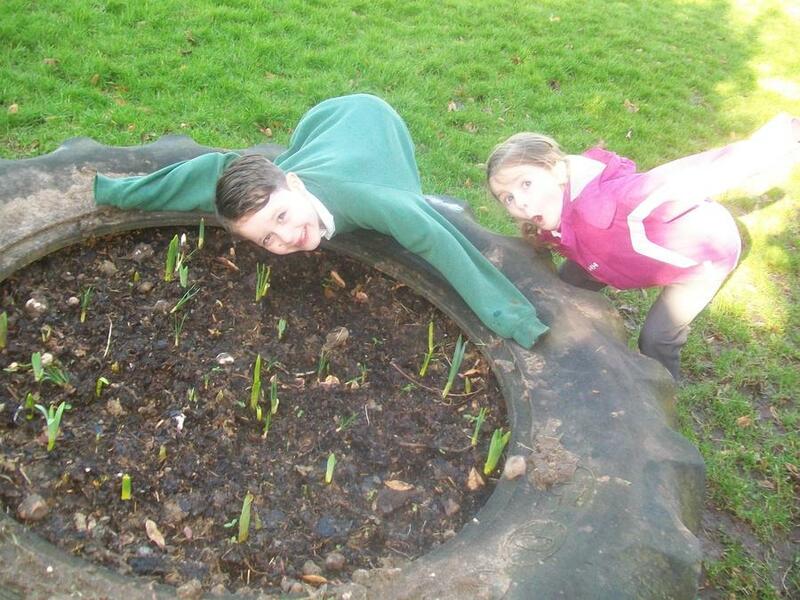 The children chose suitable places to plant the bulbs around the pond area. 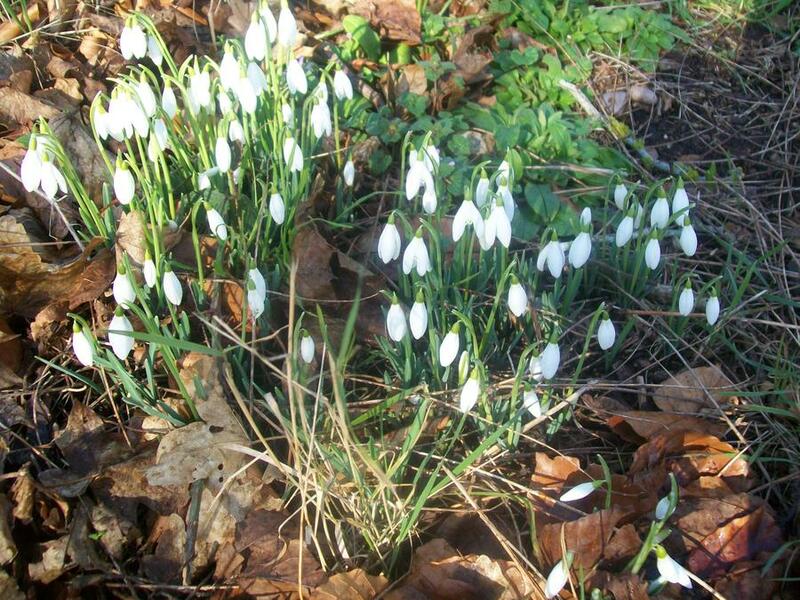 The bulbs will flower from January through to May. 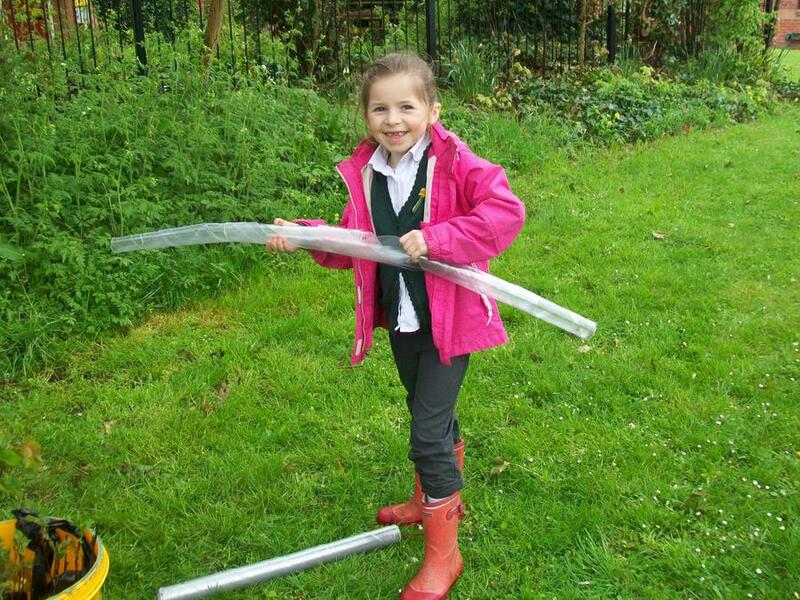 The Eco-Council would like to say a big thank you to all the people who volunteered to help clear the pond area. 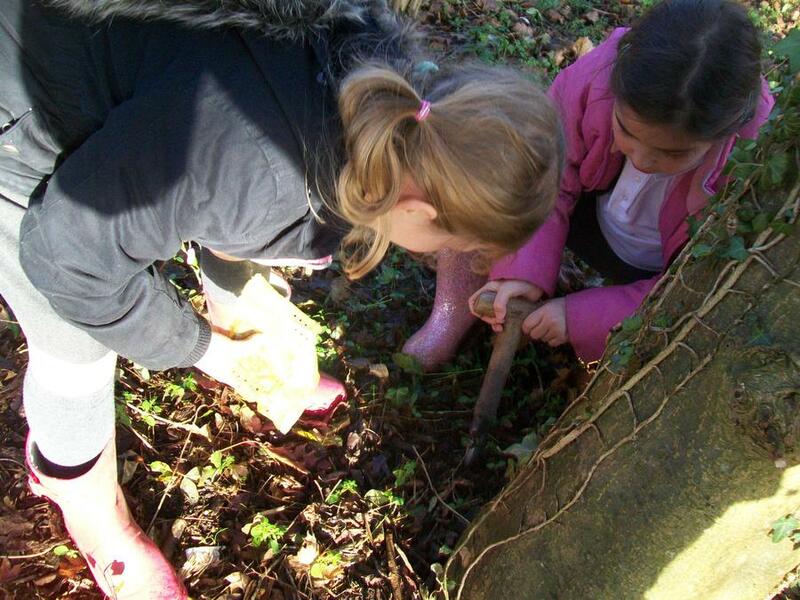 We had a very busy day clearing away leaves, pulling out weeds and brambles and moving sticks and logs. 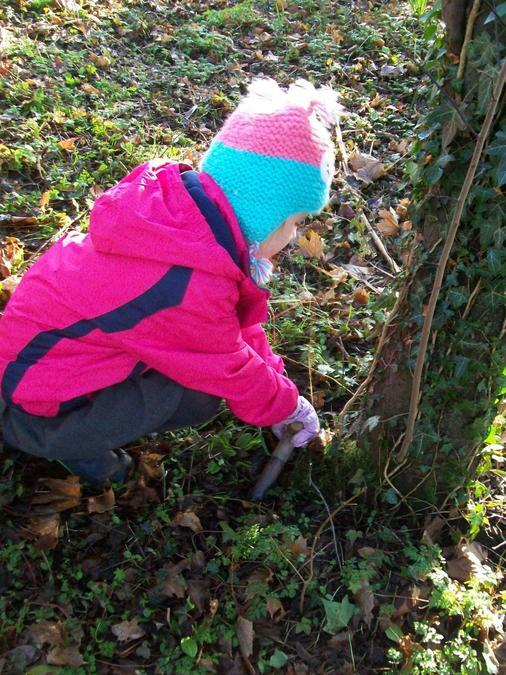 There was a very exciting moment when we discovered a hibernating hedgehog sleeping under some logs and leaves! 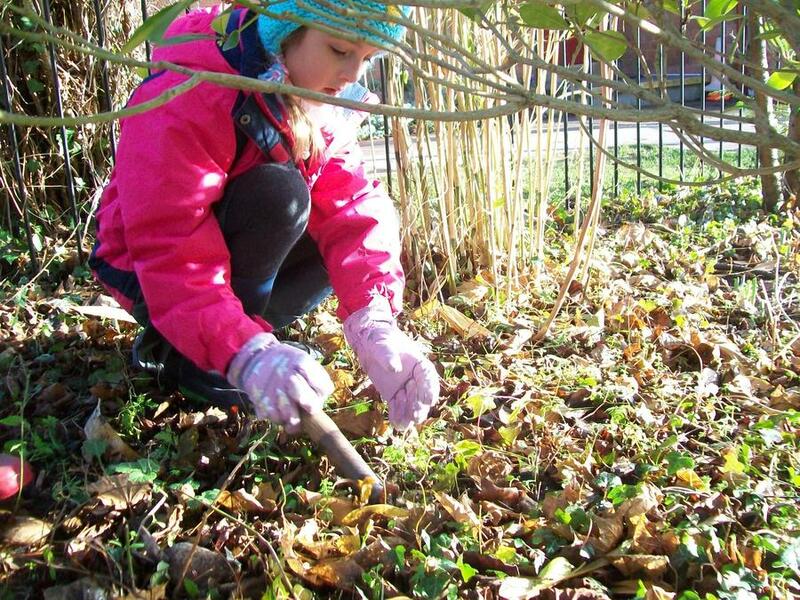 We were quiet and carefully placed the logs and leaves back over the hedgehog to make sure he stays nice and warm over the winter. 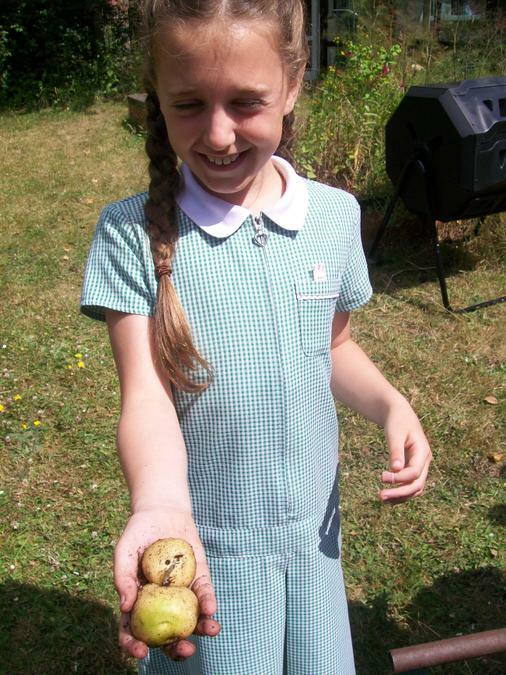 Whilst pulling out some weeds, we also discovered a bouncy frog who jumped back into the pond! 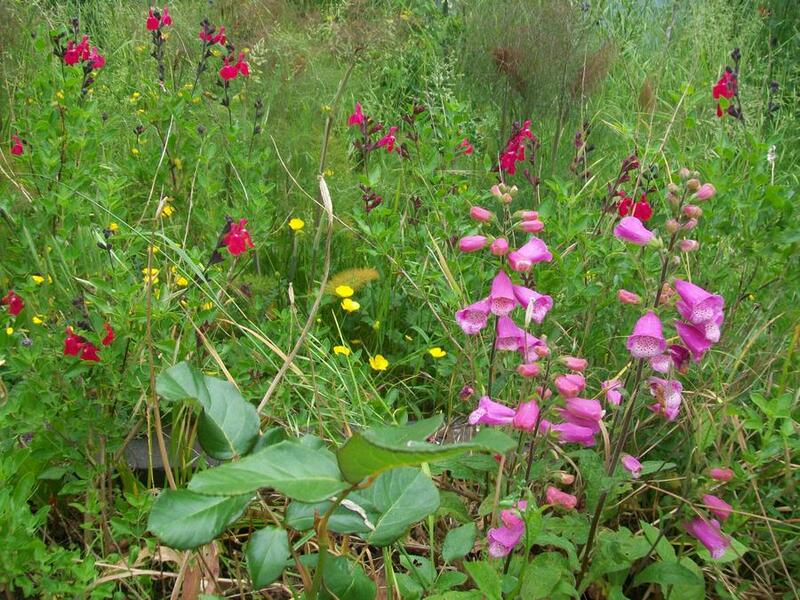 We are really pleased with how the pond is looking now, we have a great space to use. 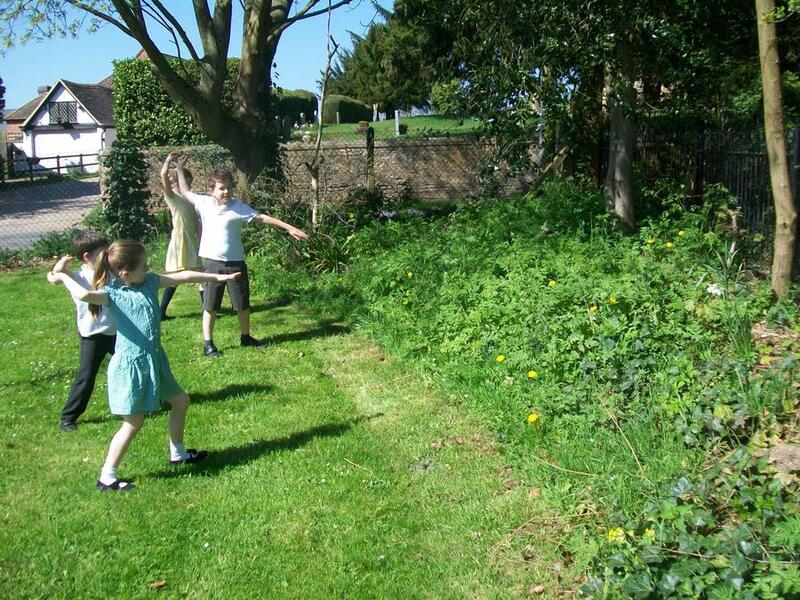 We are now planning on having a joint meeting with the School Council to plan what we will do with this fantastic space. 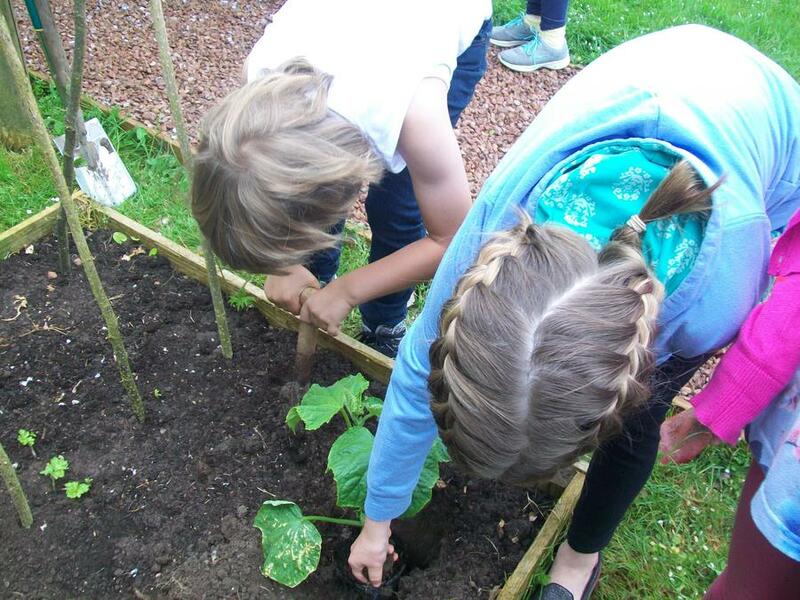 After the long Summer holidays, we were very excited to come back and find lots of runner beans growing in our vegetable patch. 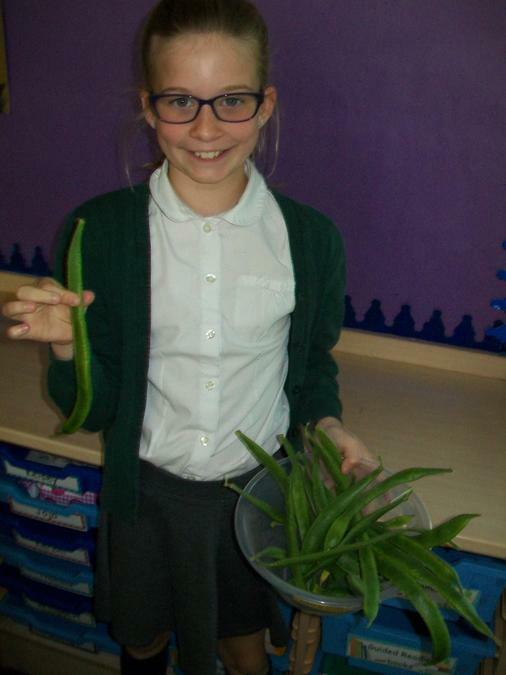 We picked the beans that were ready and have given them to our cook who will prepare and serve them at Lunch time for us all to enjoy. 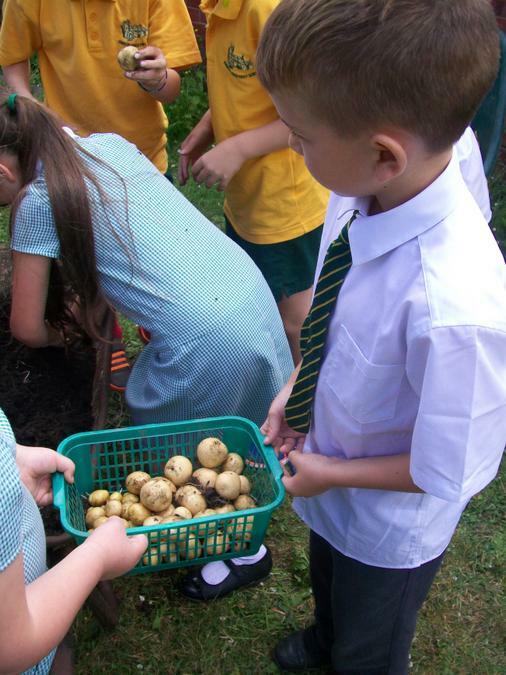 Class two and Class three have been growing potatoes and today (22.6.18) they were ready to dig out! 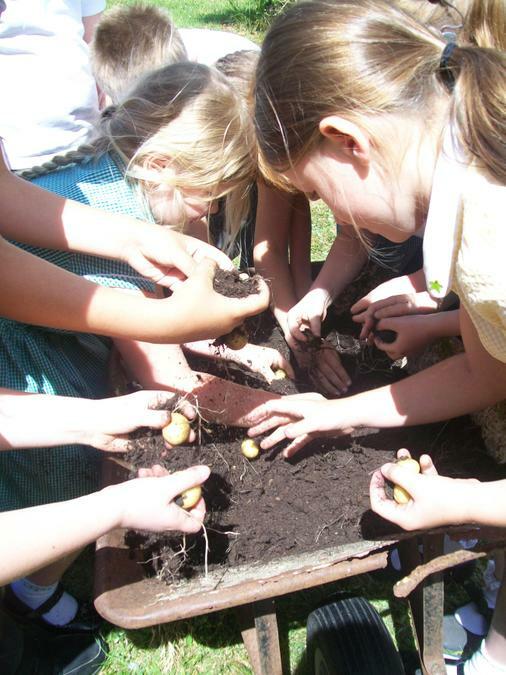 The children had great fun getting their hands dirty to find the potatoes in the soil. 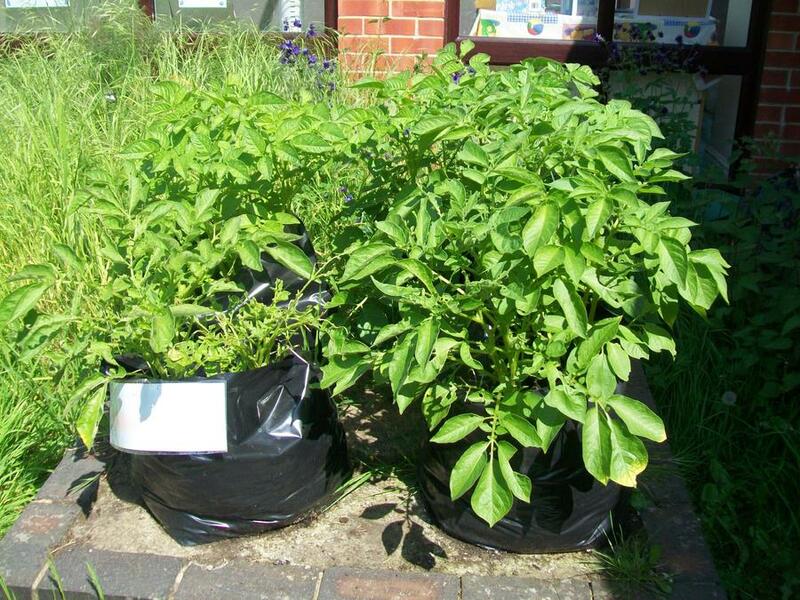 We are going to ask Sandra in the Kitchen to cook our potatoes, with some mint from our garden, to enjoy at lunch time. 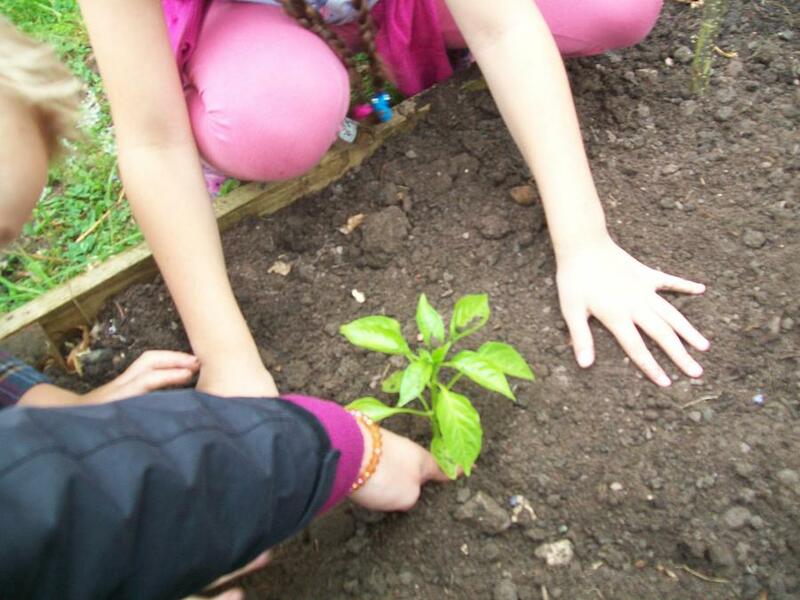 This afternoon, the children were busy planting some new vegetable plants in our vegetable patch. 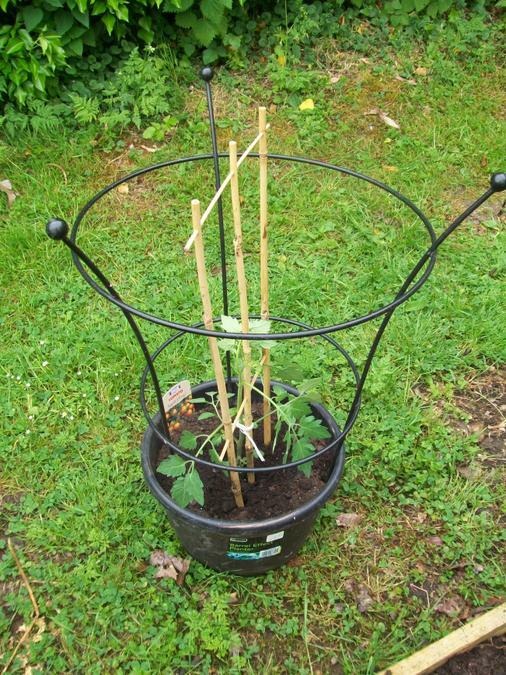 We planted a tomato plant, a cucumber plant, a sweet pepper and some runner beans. 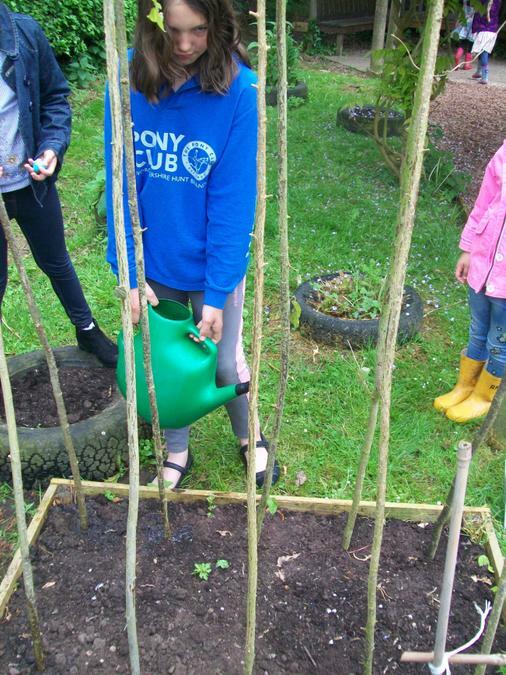 Farmer Phil kindly came up to help us plant them and to make some cane wigwams to support our plants as they grow. 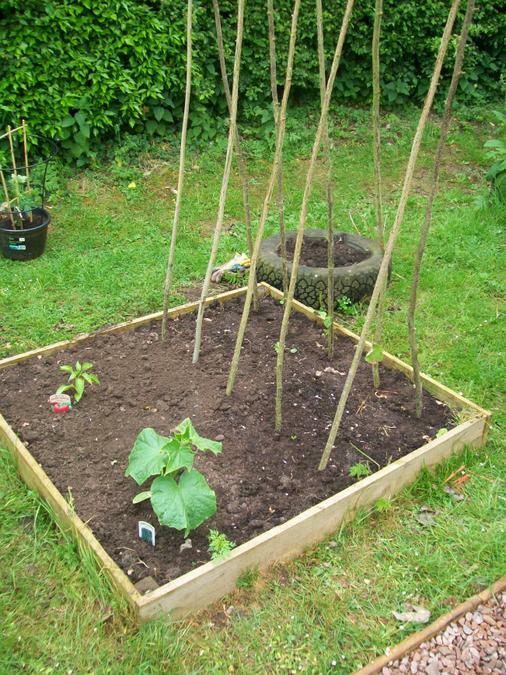 Here's our freshly planted vegetable patch! 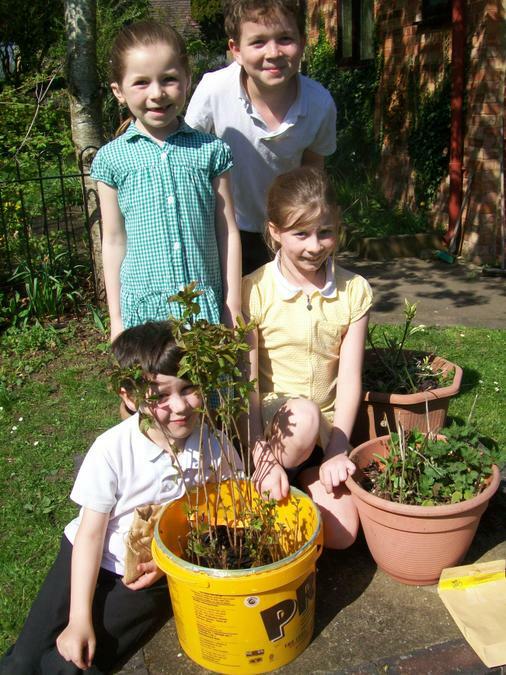 We are looking forward to watching our plants grow. 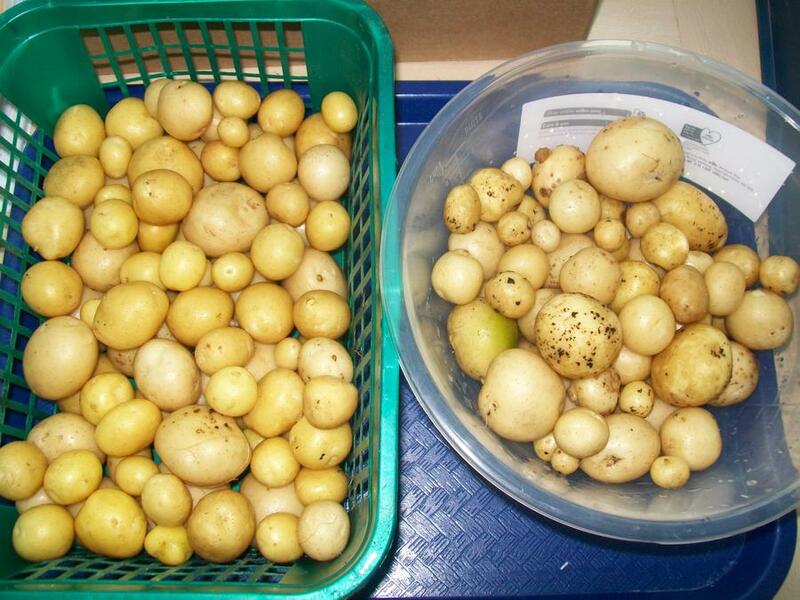 Look at how big our potato plants have grown! 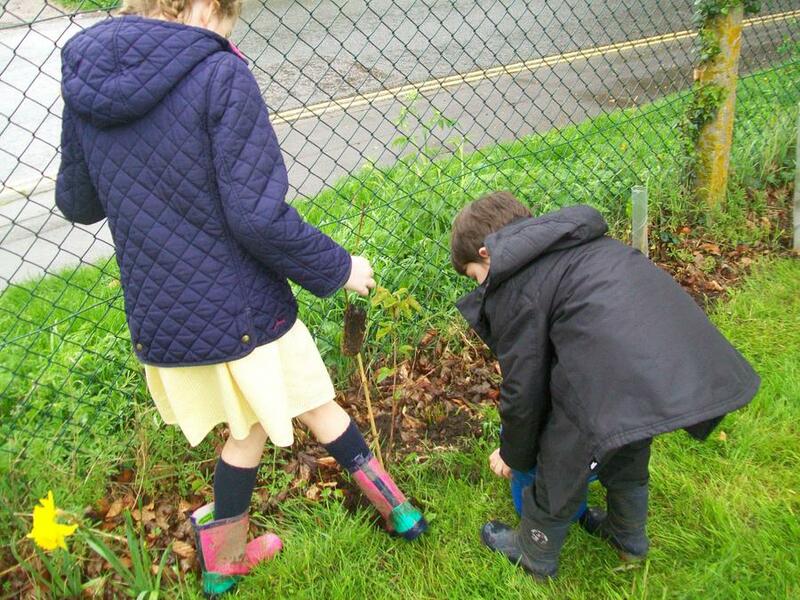 Today we planted our trees! 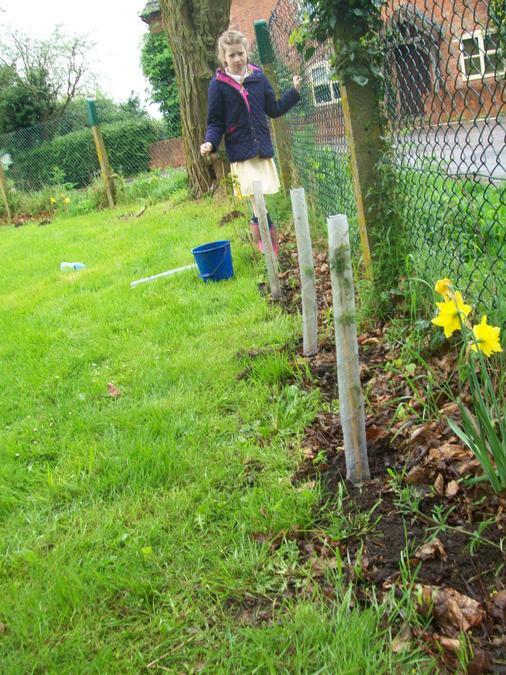 We had already marked out with canes where we wanted to plant the trees. 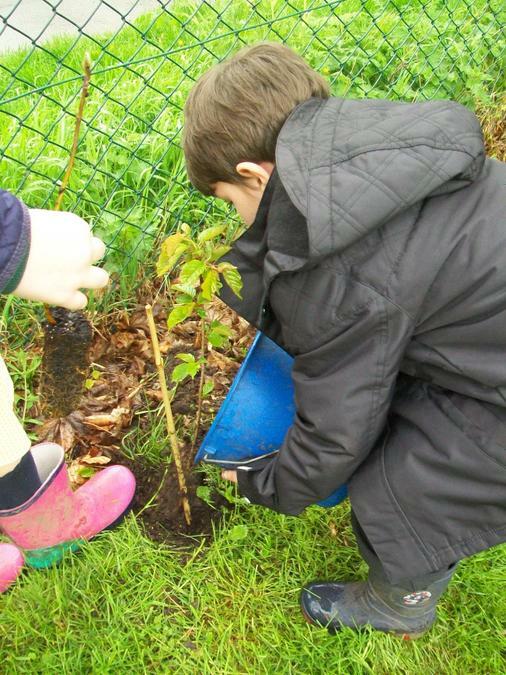 We decided to plant the trees alternatively; Cherry, Rowan and Silver Birch. 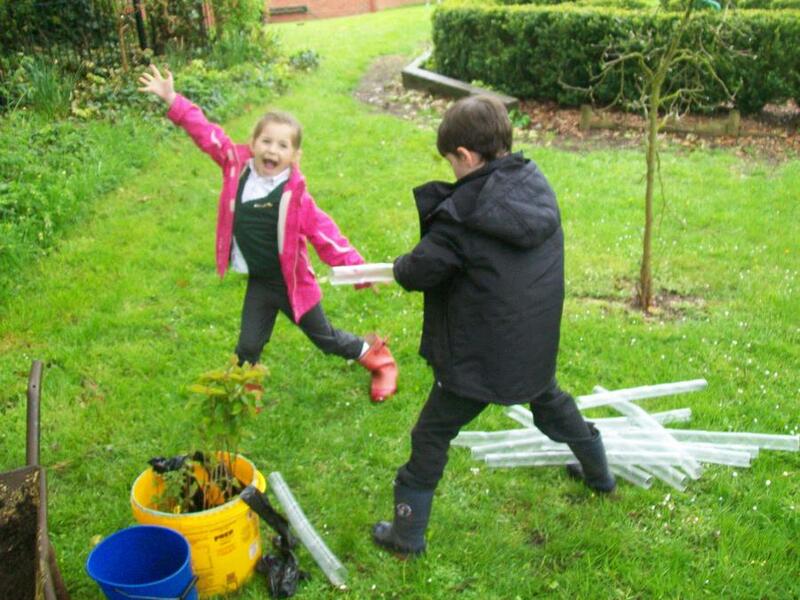 We took it in turns to collect the saplings, fill with compost and press around the base of the sapling to secure the sapling into the ground. 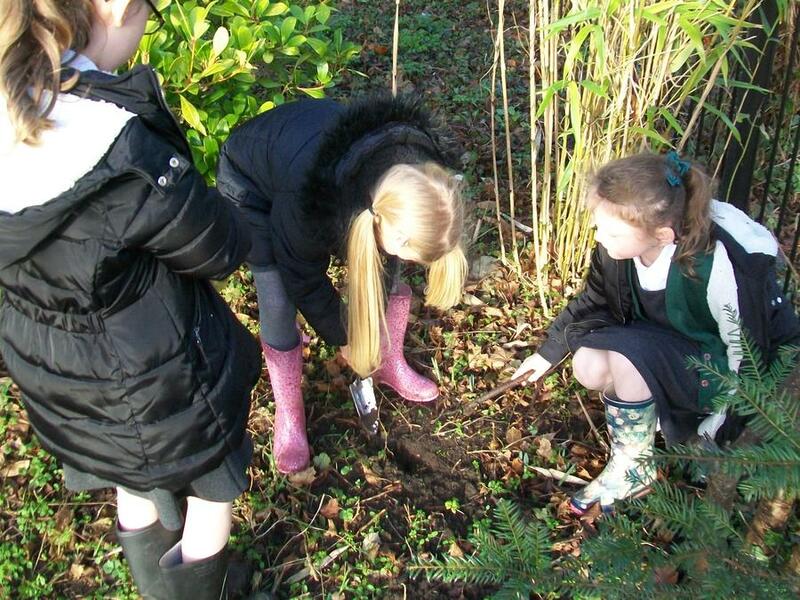 We also placed a cane with each sapling to support it as it grows. 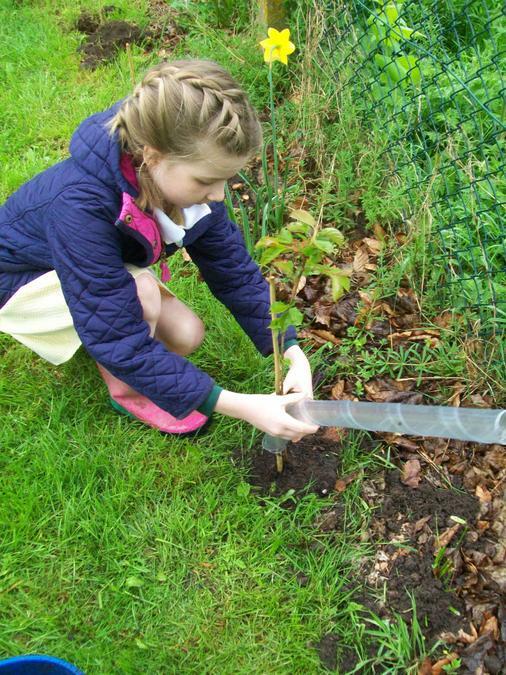 To help the sapling start growing, with placed a protective guard around it to protect it from strong weather conditions and animals such as rabbits, eating the sapling. 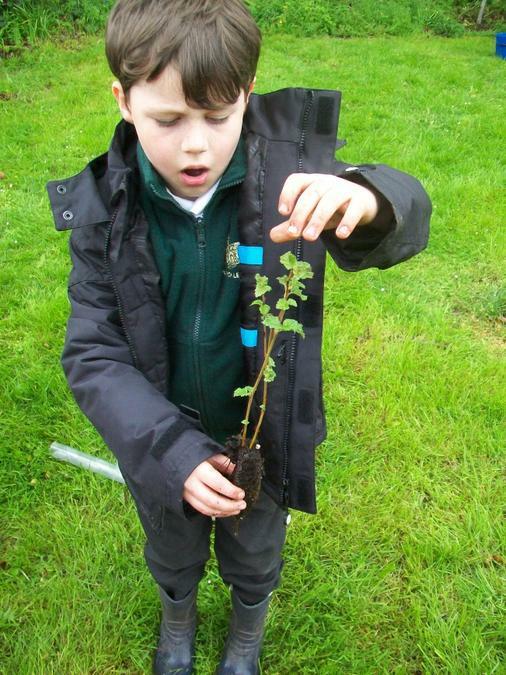 The woodland trust were giving away packs of trees to schools, we entered and completed the application and...our application was successful! 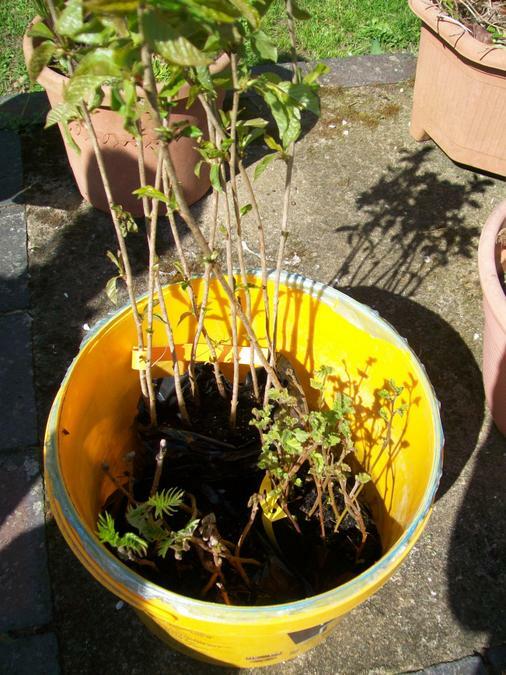 Our pack of 30 tree saplings were delivered today (20.4.18), we have got 10 silver birch, 10 Rowan and 10 wild cherry trees. 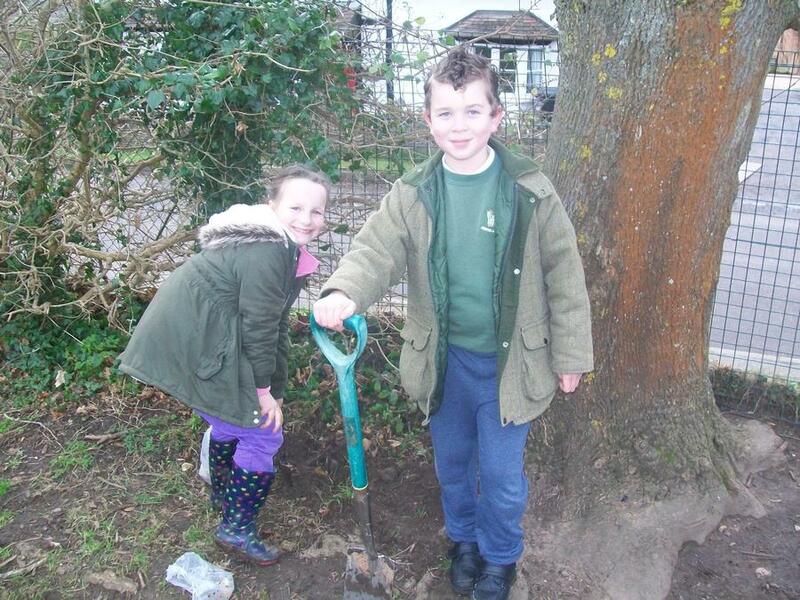 Together, the Eco-council and School council have been planning where the best areas would be to plant the saplings, then next week the Eco-council will give an assembly to the school showing the trees and explaining how each class will have a chance to plant 10 trees each. 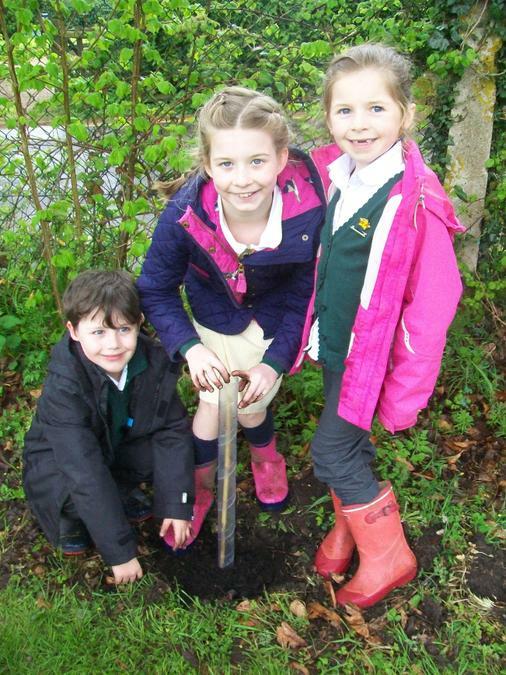 We are looking forward to planting our trees! 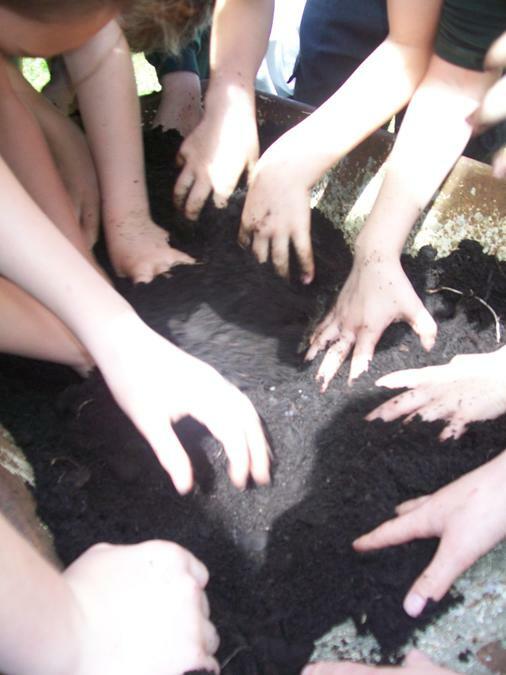 To encourage the bees to visit our school grounds, we planted our bee bombs today. 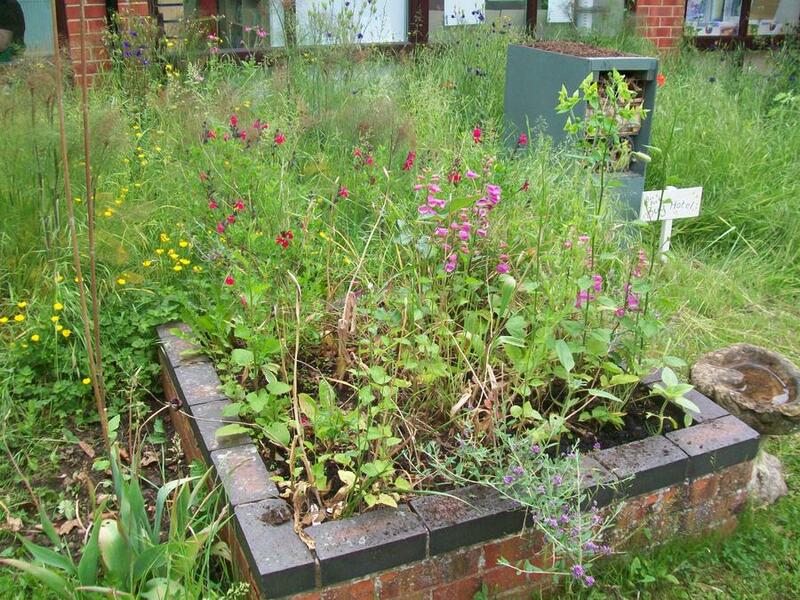 Each bee bombs contains lots of tiny wild flowers seeds which (when grown), will attract pollinators. 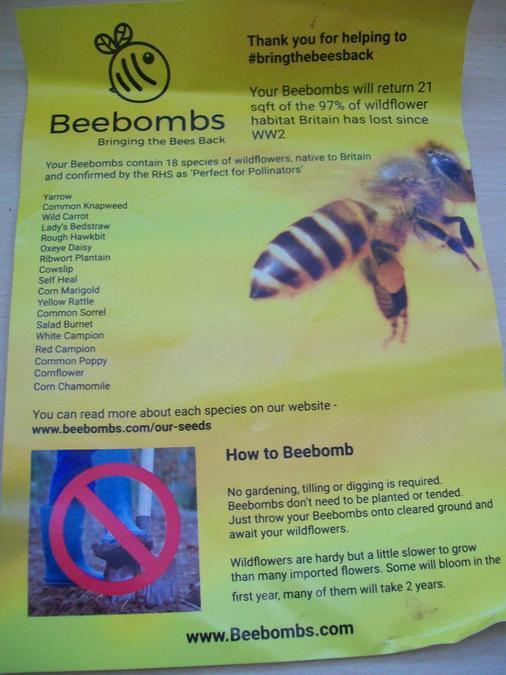 The great thing about the bee bombs was no digging needed! 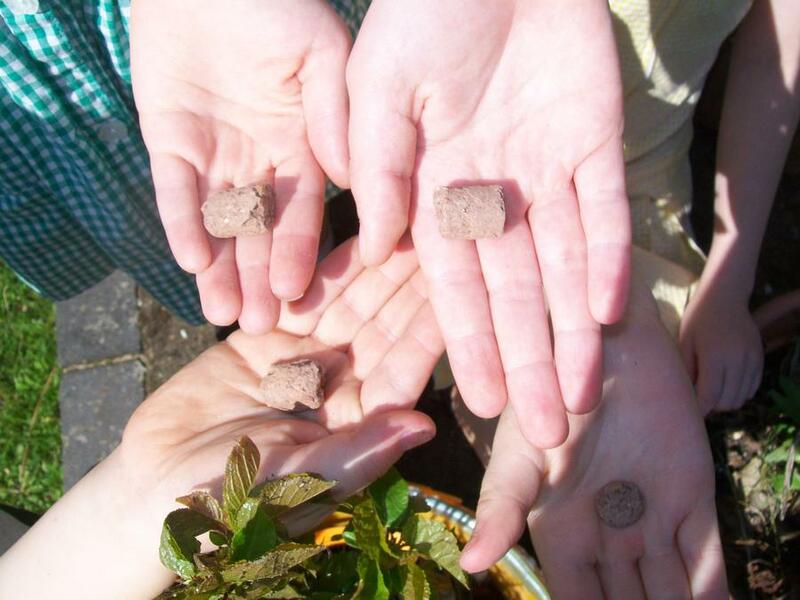 You just throw the bee bomb onto the ground and the seeds will settle and begin to grow. 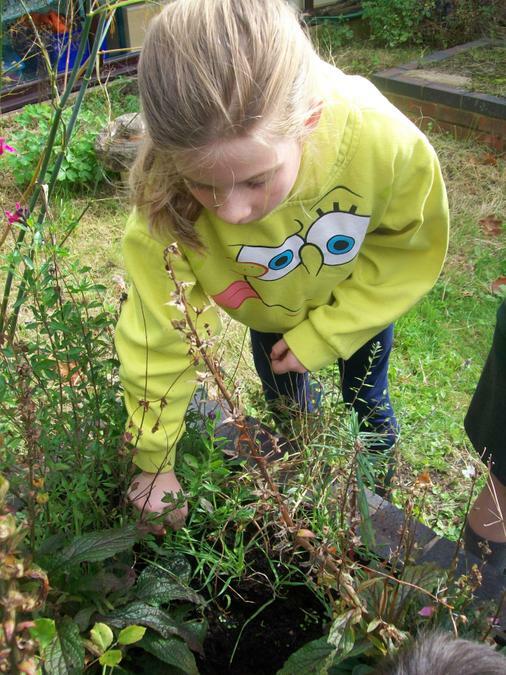 We checked on our garden after the half term break, it was amazing to see how it has changed. 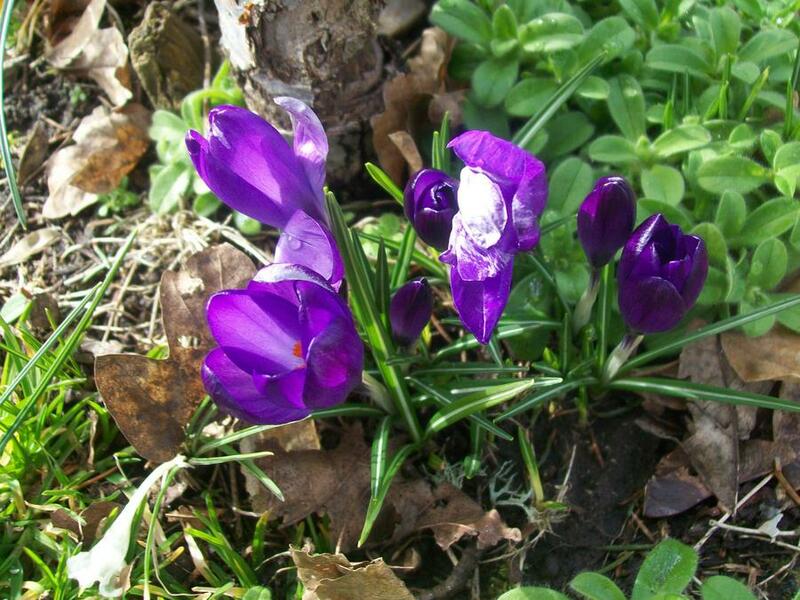 Lots of Summer flowers have grown, and some of our bulbs have started to come through the soil. 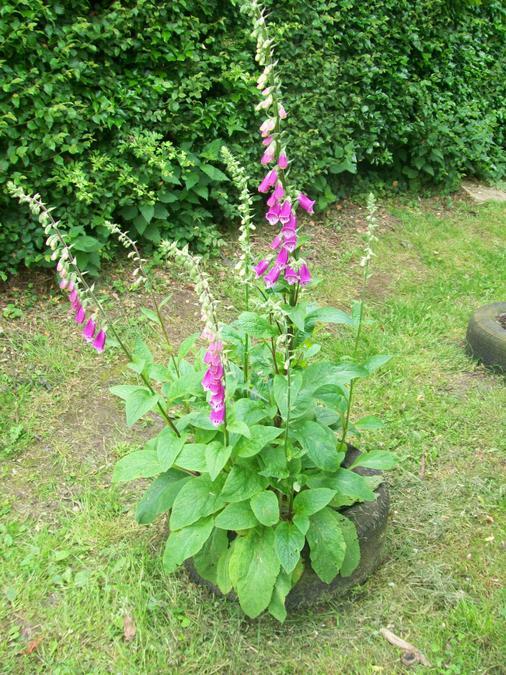 These are called foxgloves, the bees love these! 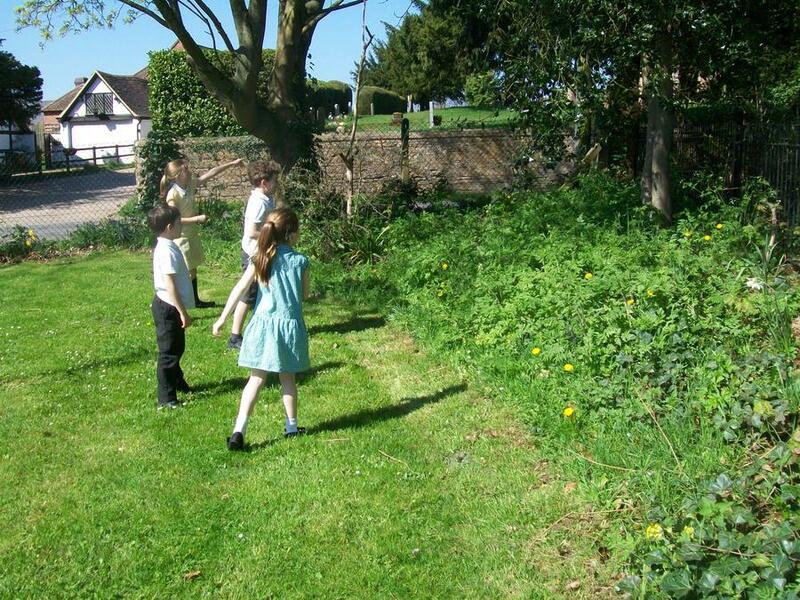 These are photographs of our wild area, this space is left for the birds and insects to enjoy. 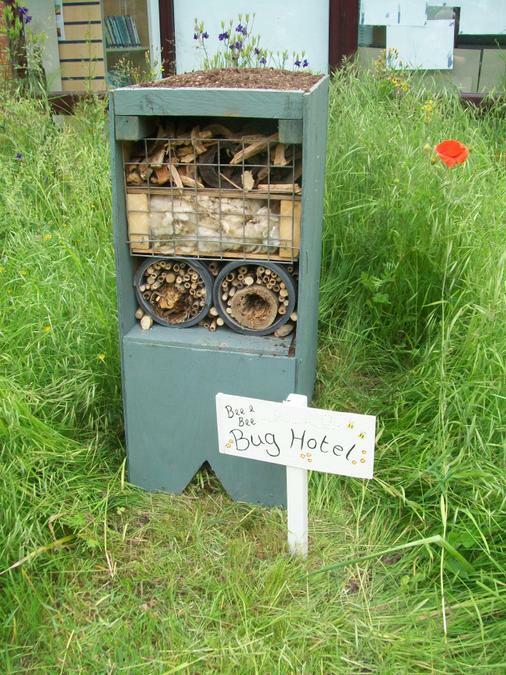 Farmer Phil kindly designed a fantastic bug hotel for us, we have placed it in our wild area. 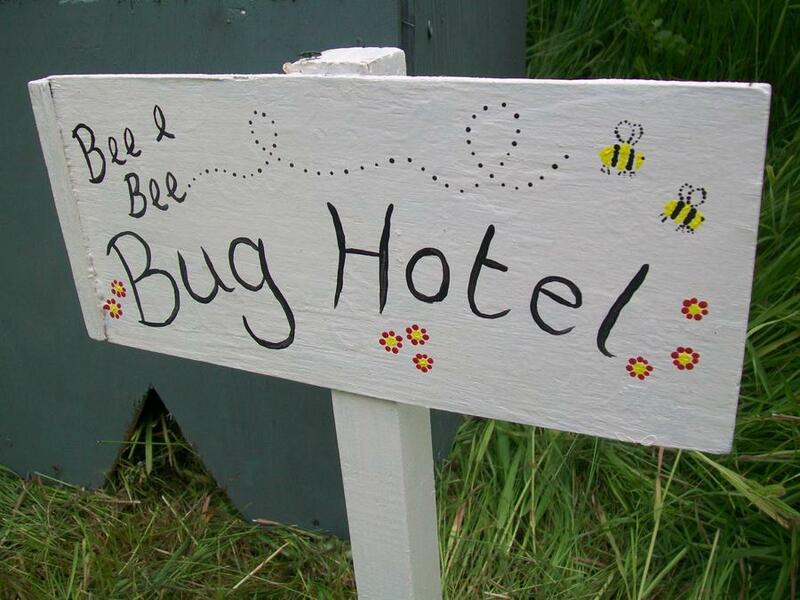 Thank you to Mrs Dandy for making us our 'bee and bee bug hotel' sign. 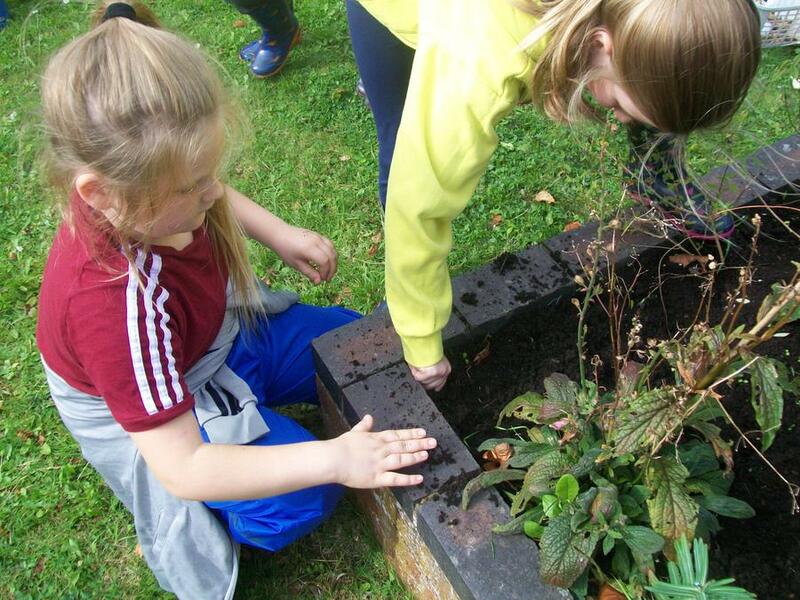 We hope lots of different insects will visit our bug hotel. 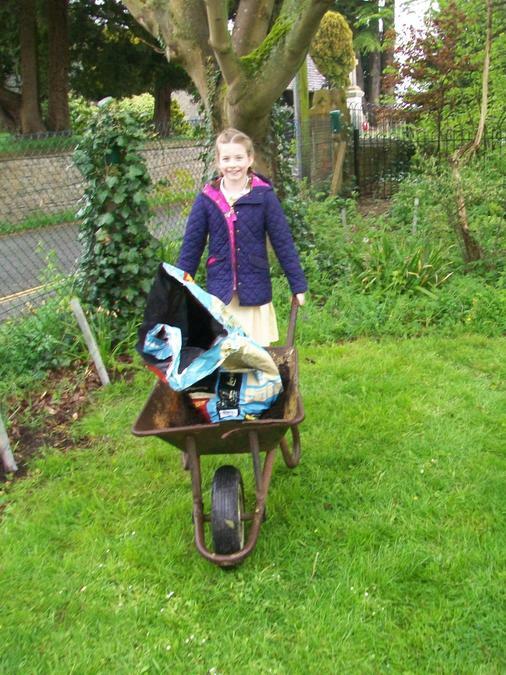 The Eco-council were very grateful for the kind donation of daffodil and tulip bulbs from Annabel's Nanny. 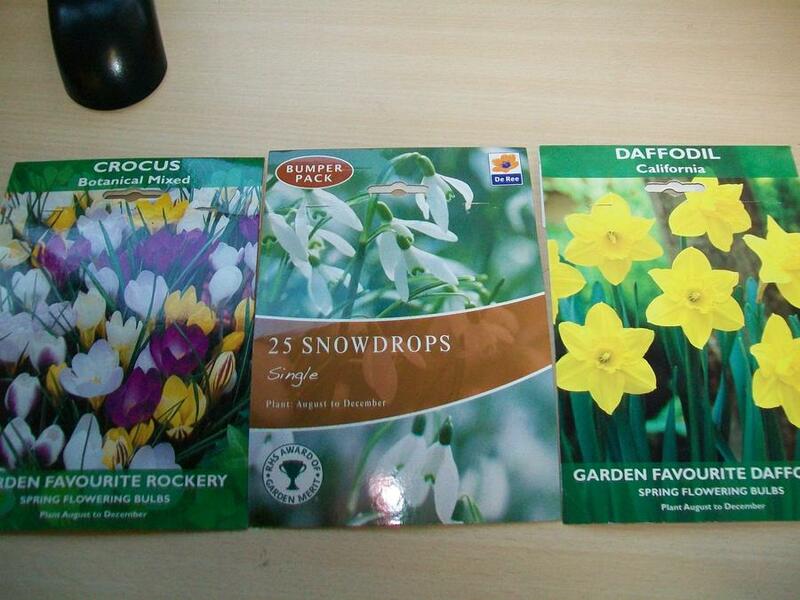 It was important to plant them quickly as they are spring bulbs so they need to be planted as soon as possible. 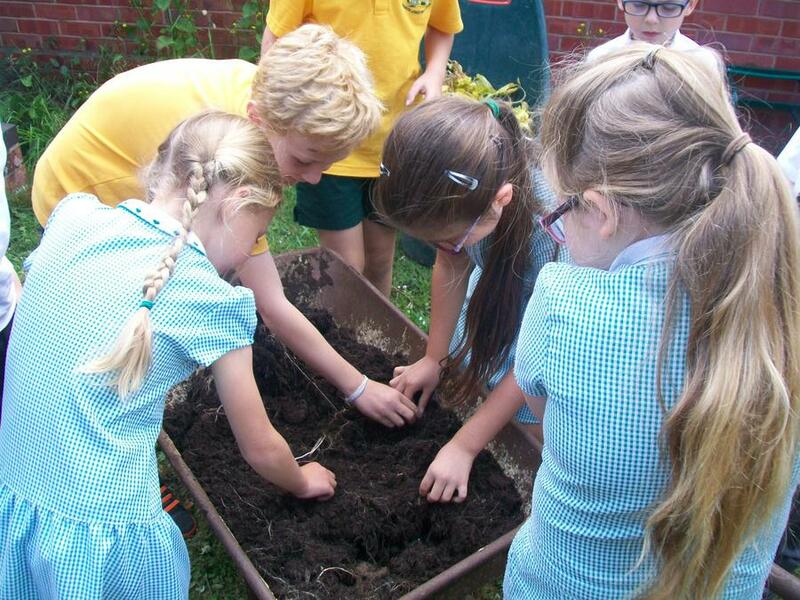 Farmer Phil kindly came in to help us plant the bulbs and choose the perfect areas in the school to plant them. 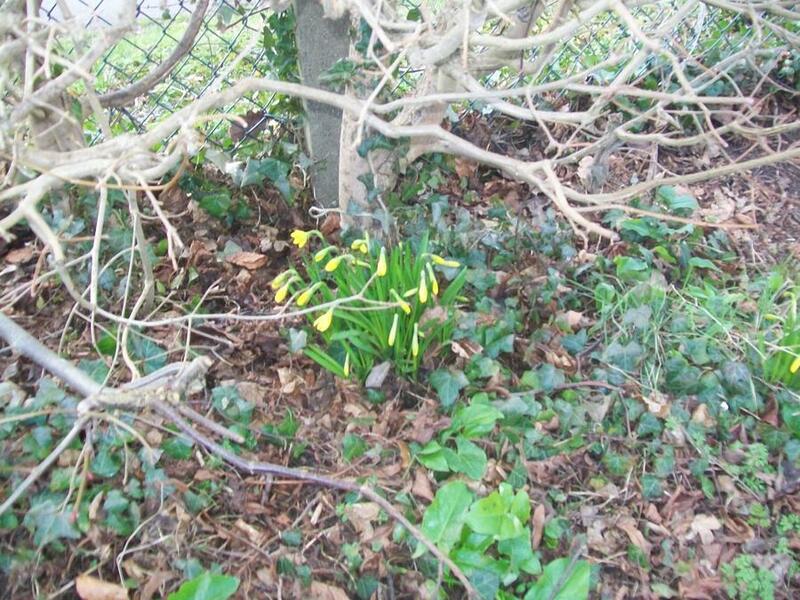 The School grounds during Winter. 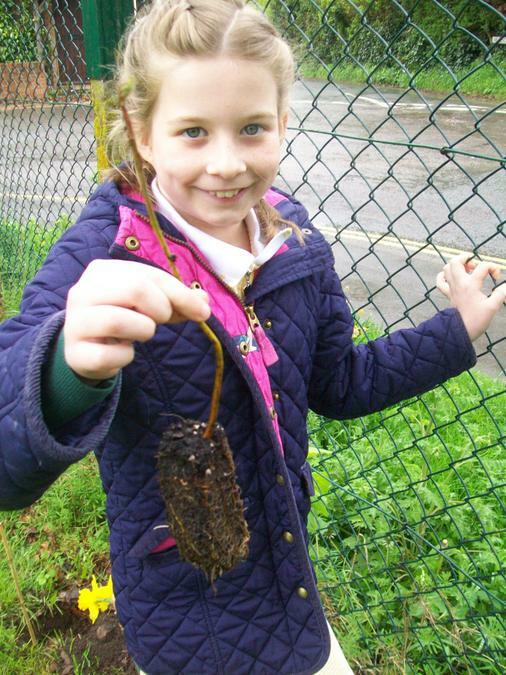 The Eco-council were very excited after they spotted the bulbs we planted in Autumn starting to appearing from the soil! 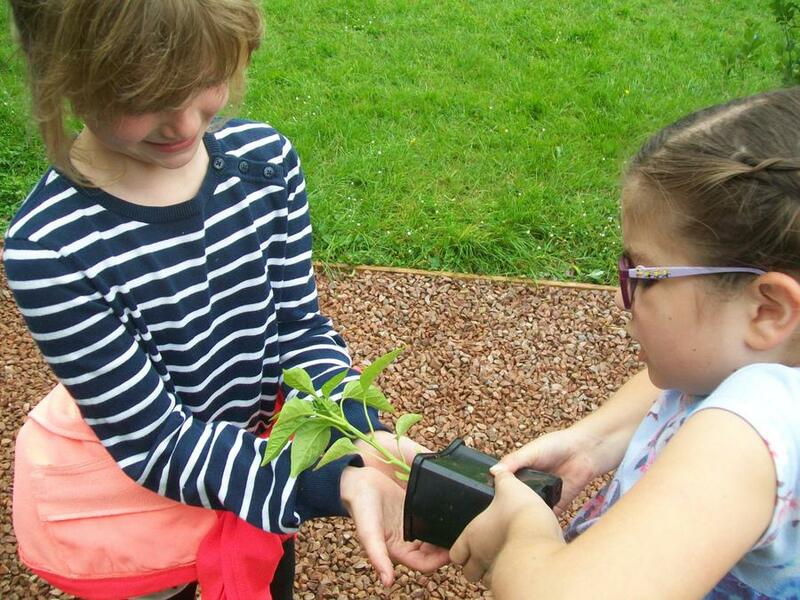 We are going to keep a close eye on these to make sure they grow strong and healthy. 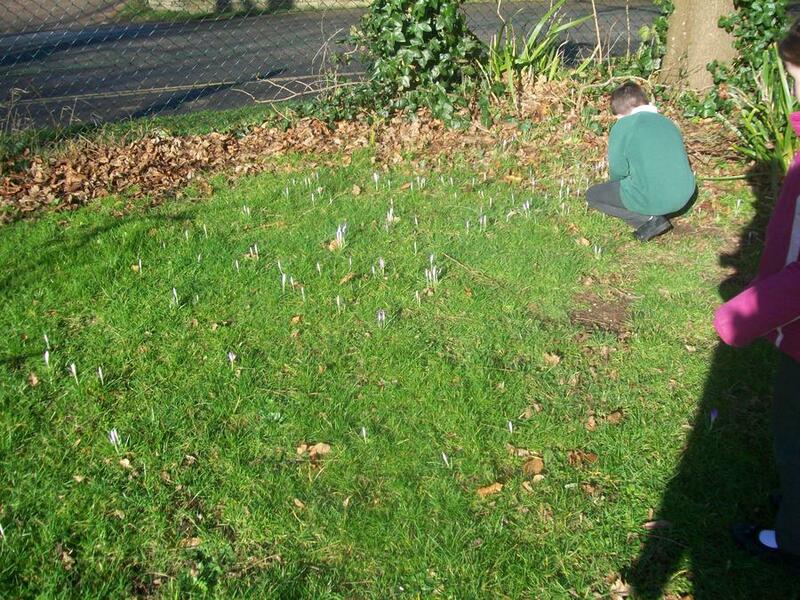 The children also discovered some crocus' and snowdrops growing by the edge of the school field. 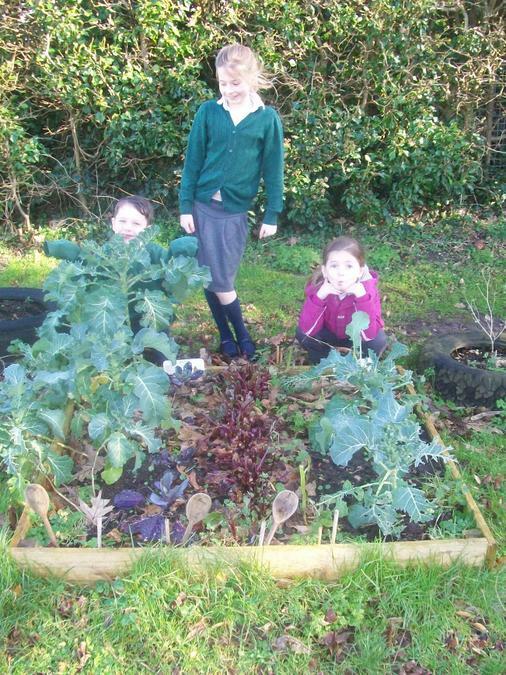 Our Winter vegetables are also growing well. 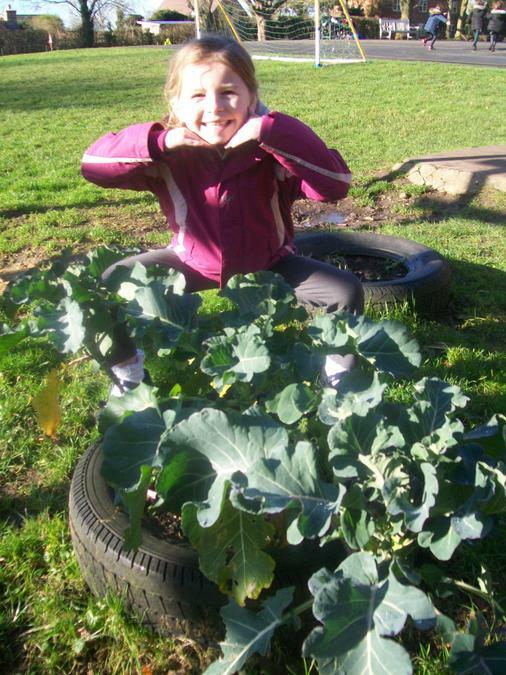 Here is our broccoli, purple sprouting and broad beans! 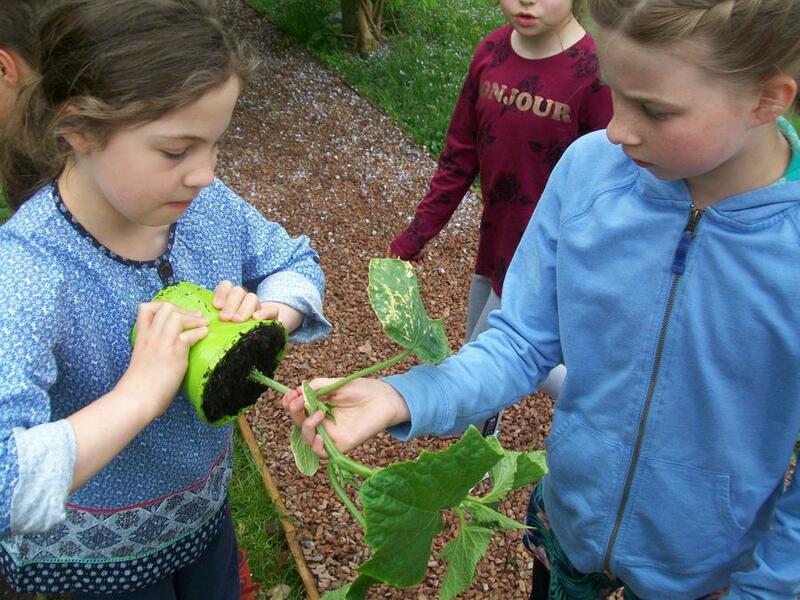 Some members of the Eco-council checked the vegetables that have been growing in the school grounds. 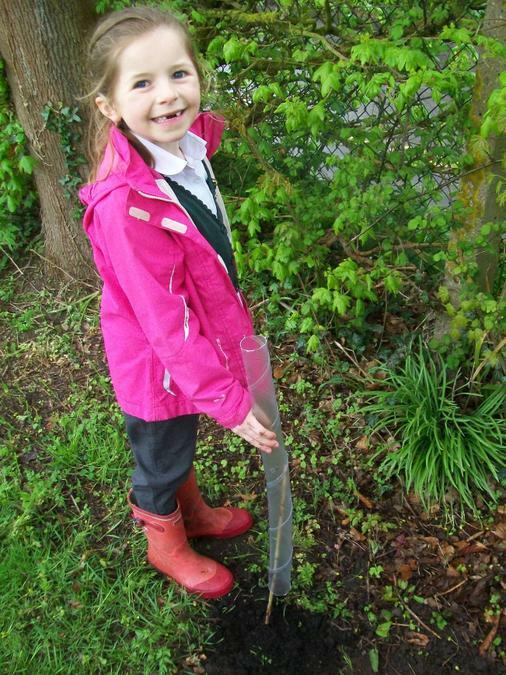 Wow, our corn on the cob is growing really tall! 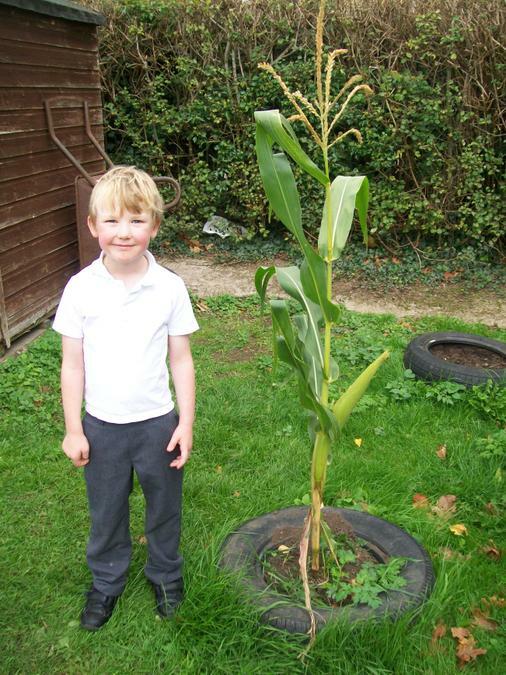 Hopefully it won't be long until the sweetcorn is ripe. 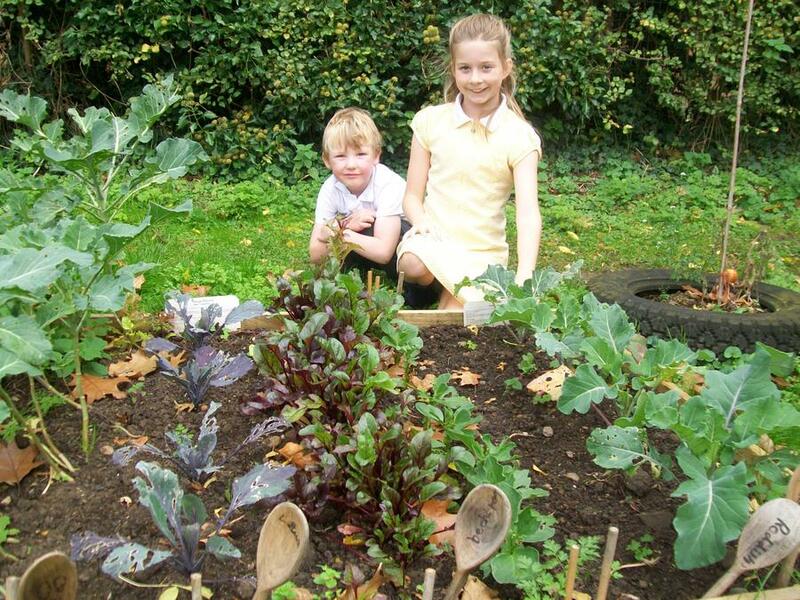 In our vegetable patch we have Red Cabbage, Broad Beans, Beetroot and Broccoli growing. 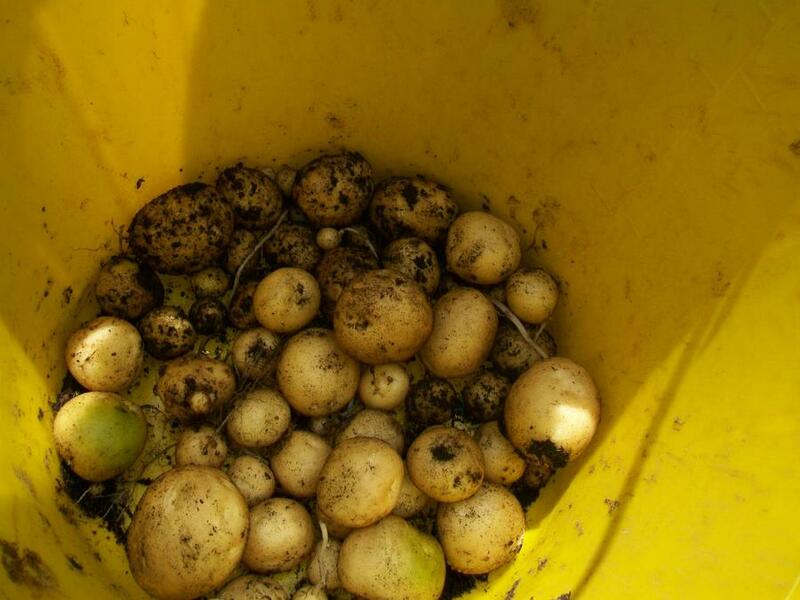 When they are ready to be harvested, we will give them to our chef to cook for lunch. 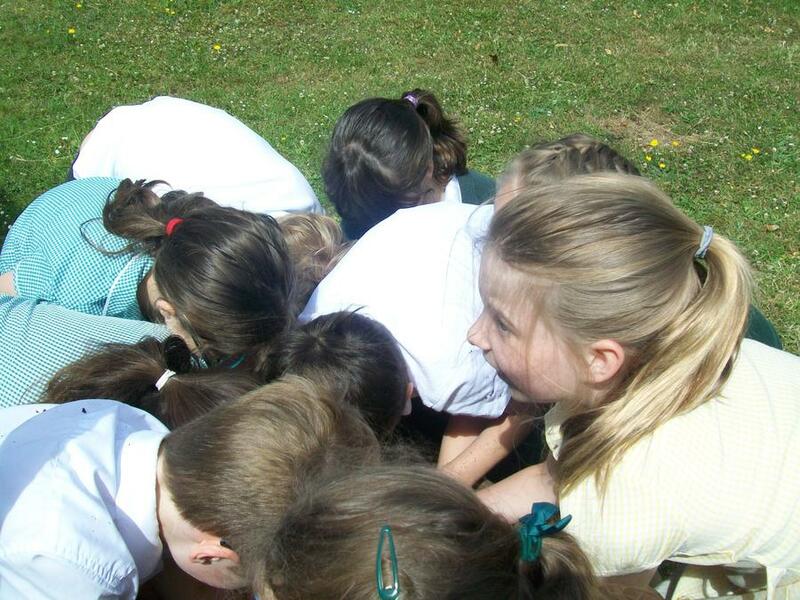 On 5/10/17 at lunchtime some children spotted a very unusual looking caterpillar crawling across the playground. 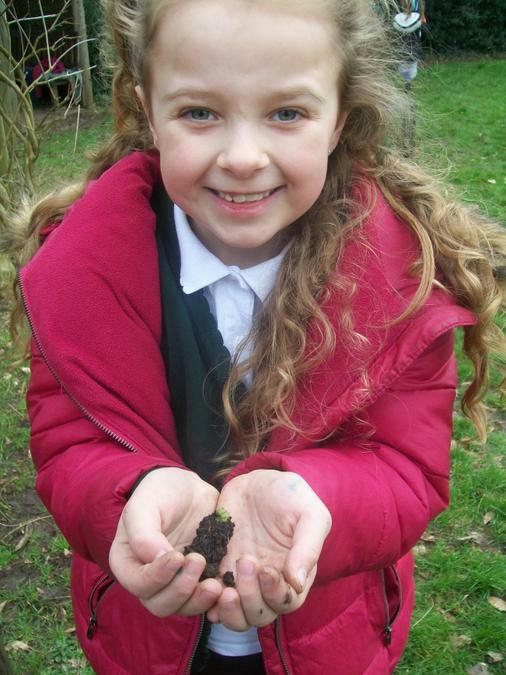 The caterpillar was very brightly coloured, large in size and very hairy! 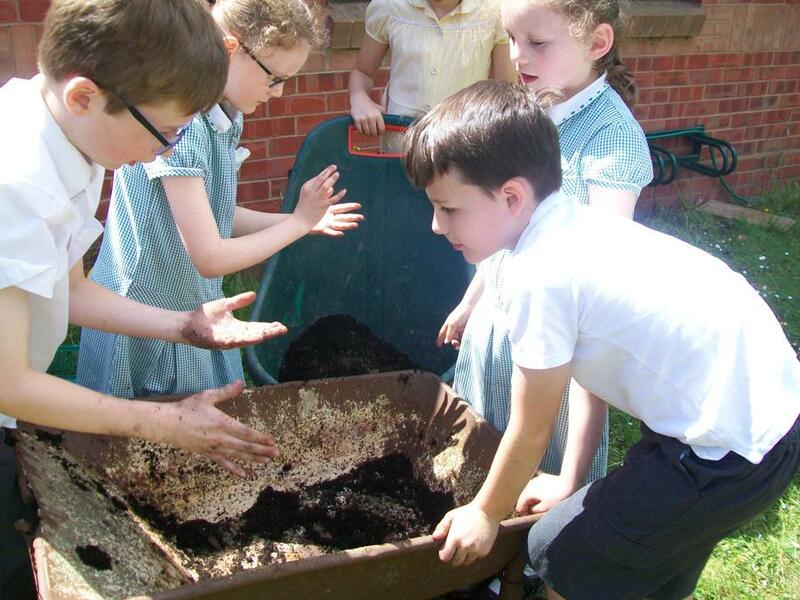 Miss Curnock was not sure what type of caterpillar it was, the Eco-council are going to do some research to find out what type of caterpillar it is. 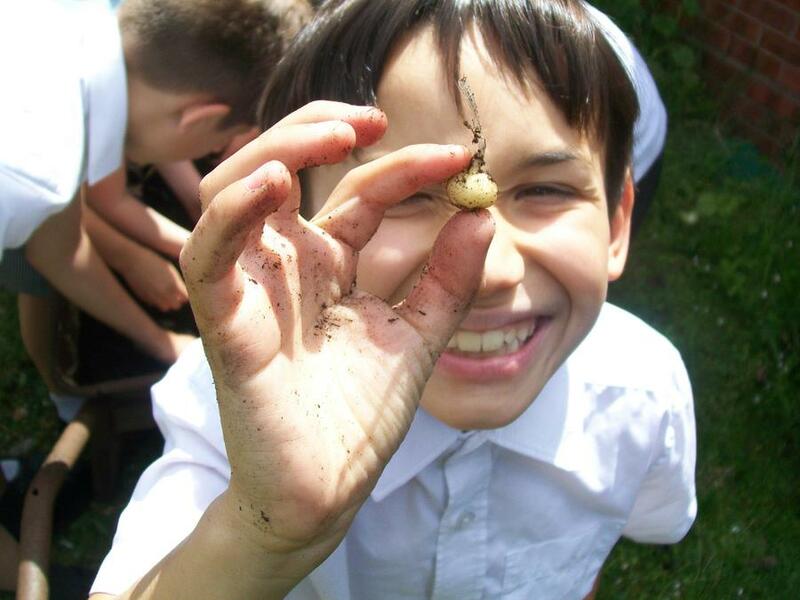 Do you know the name of this caterpillar? 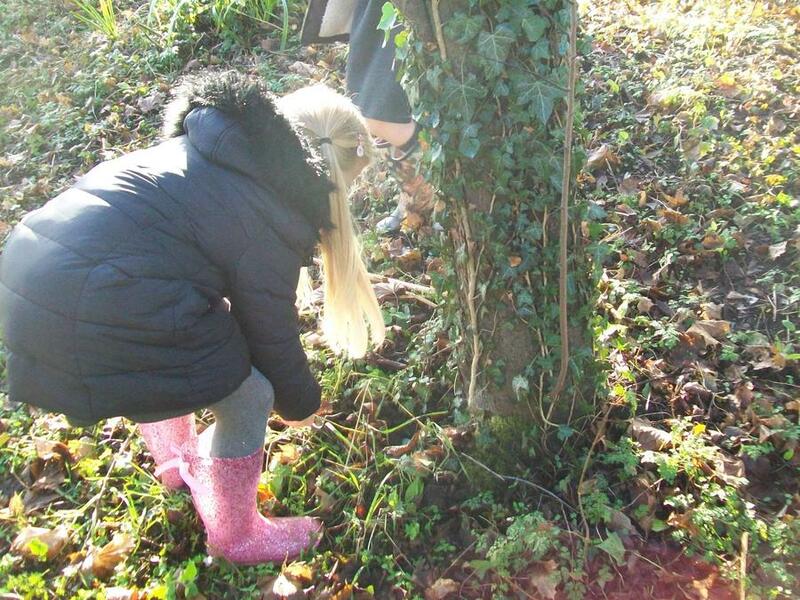 Miss Curnock set the Eco-council a mission to find out what type of caterpillar it was. 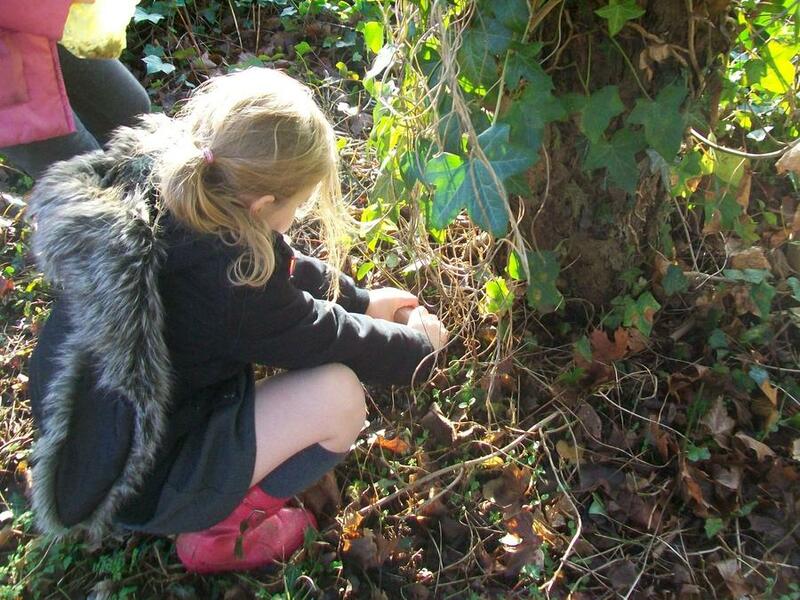 The children did some research and found out that it is a Pale Tussock Moth Caterpillar! 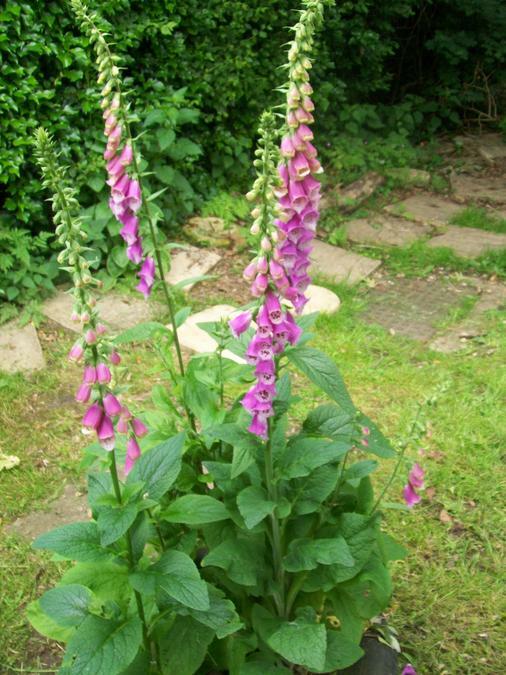 They are commonly found in gardens, hedgerows and parks in England. 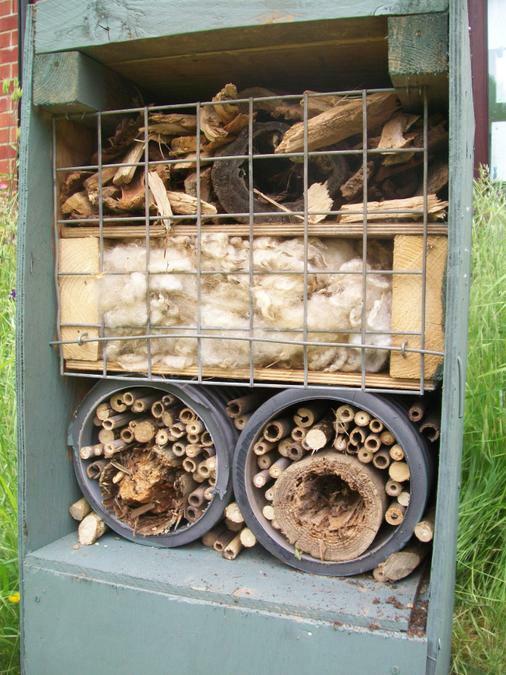 We think this is a male because the males have an orange-brown antennae. 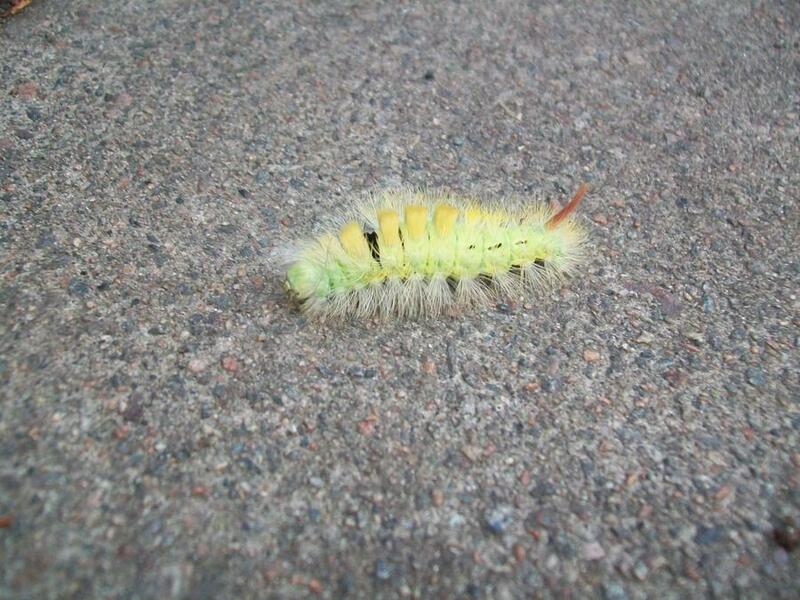 This caterpillar is also known as a larvae, it is bright green-yellow, with four tufts of golden yellow hairs. 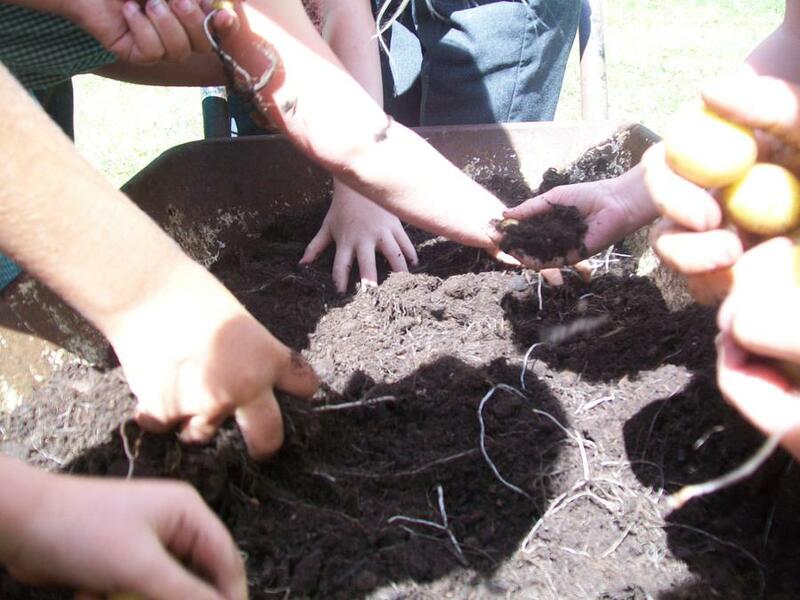 They will grow slowly between late June and early October and then overwinter they make their pupa where they will transform into a moth. 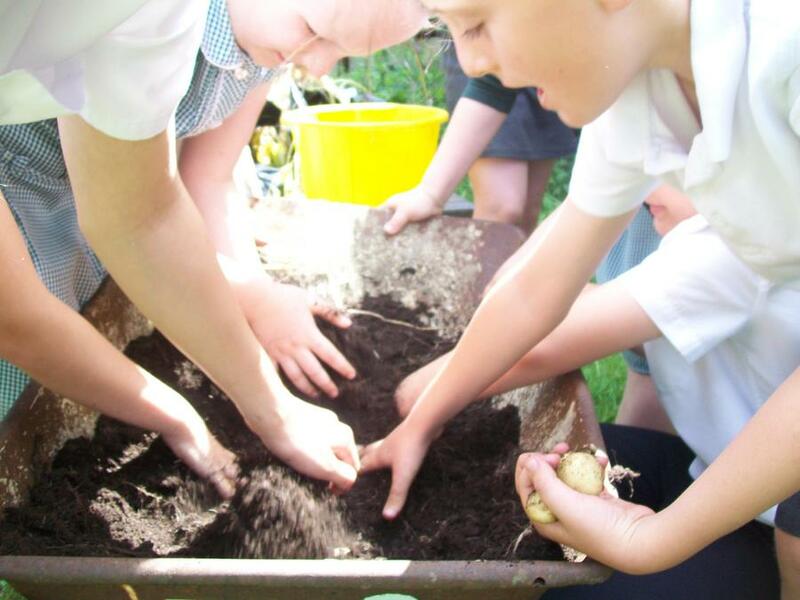 On Friday 29th September, Phil Curnock; a local farmer and keen gardener, visited the school to help the Eco-Council plant a selection of spring bulbs. 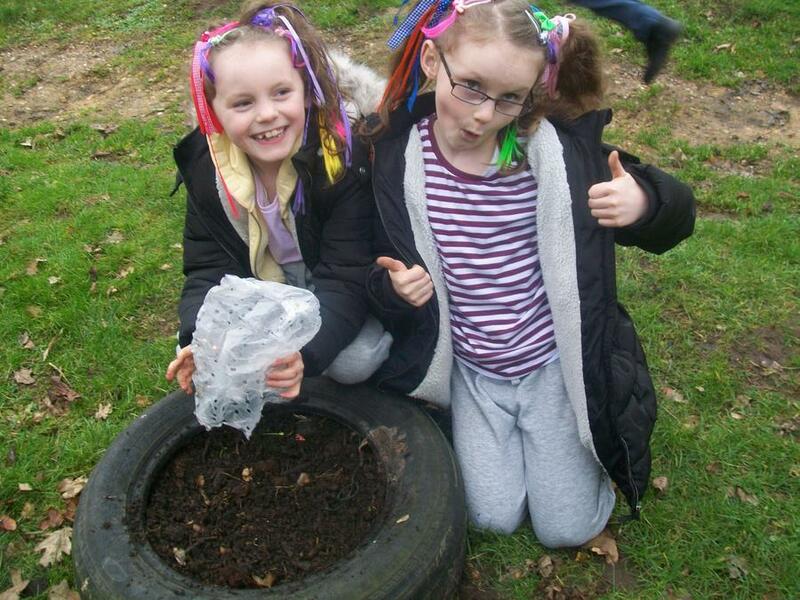 The Eco-council selected the bulbs they wanted to plant and invited pupils to come and take part in the planting. 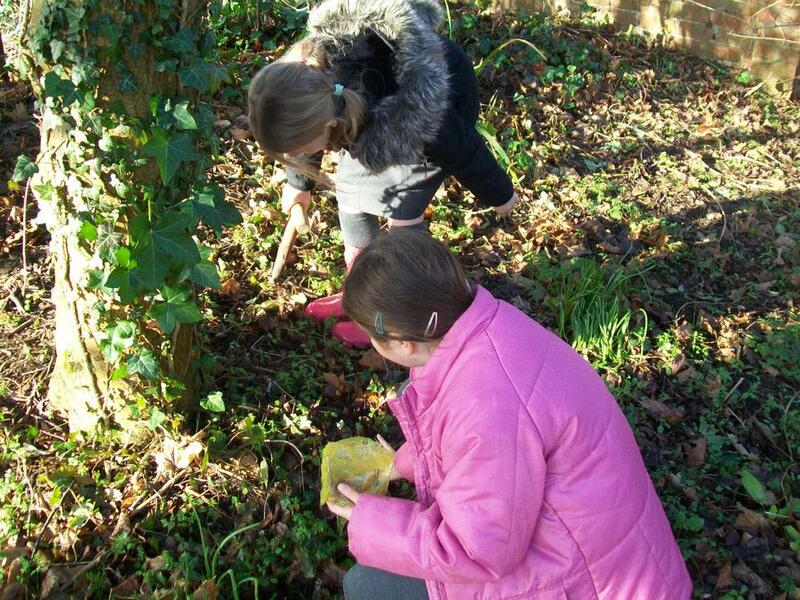 The Eco-council supported the younger children with selecting and planting the bulbs as well as engaging in conversation with them. 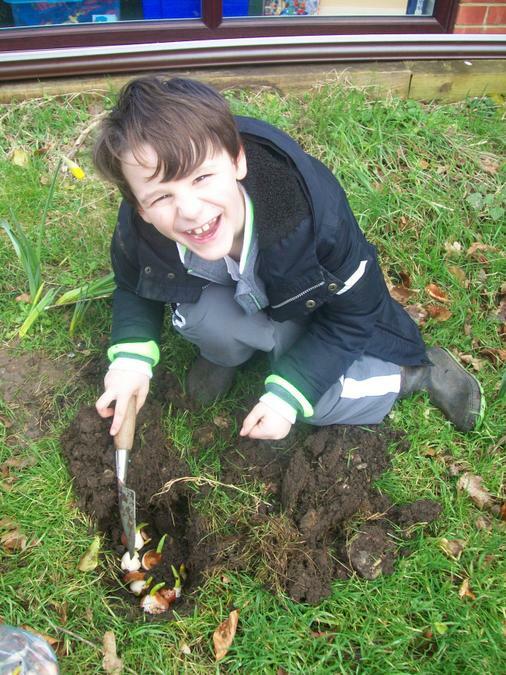 Phil Curnock shared lots of facts about the bulbs were planting, as well as showing us the correct way to plant them. 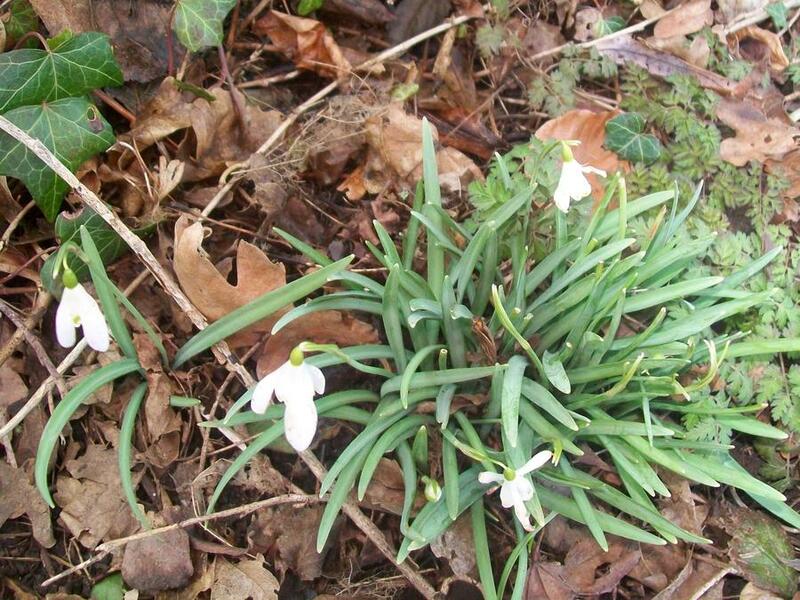 We look forward to seeing the flowers appear in the spring months between April and May!